Well, the show’s over but, we’re still buzzing from all the excitement that surrounded last week’s High Point Furniture Market. We were thrilled to see so many faces and catch up with friends, both old and new. The days were filled with great food, music, parties and, of course, LOTS of great new products! We introduced over 180 fabulous new products, some with mid-century modern, rough luxe, transitional and modern influences, and our customers loved them! Below are some of our top sellers from the show, which we are calling the best of the best! 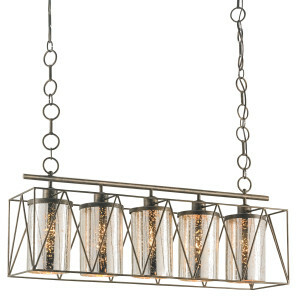 Mouth-blown glass cylinders are captured within the metal frame of the Marmande Rectangular Chandelier. Mirror that has been finished to have the transparency and intermittent patterns of mercury glass contrasts the Cupertino wrought iron framework, creating a beautiful combination. Luxury by the seaside is at the heart and soul of the Margate Mirror. 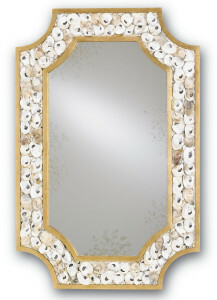 Natural Oyster shells adorn the appealing Contemporary Gold Leaf finished frame which brings sophistication to any coastal-inspired interior. With an enigmatic shape and lustrous finish, the Zephyr Table Lamp is a seductive design. 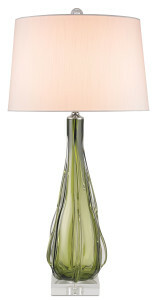 Crafted in glass, the Zephyr features a luxurious Off White Shantung shade. Stunning workmanship is highlighted in the formation of the Grand Lotus Chandelier which is made from wrought iron and sheet metal and then skillfully finished in Antique Gold Leaf. The Grand Lotus Chandelier is a gorgeous interpretation of the classic blossom. 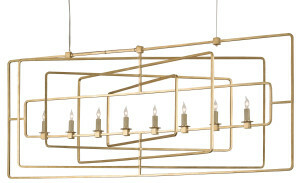 Ultra-modern in form and finish, the Metro Rectangular Chandelier is a real head turner. Multiple rectangles in varying sizes are layered and set at different angles giving a geometric and sleek appeal. 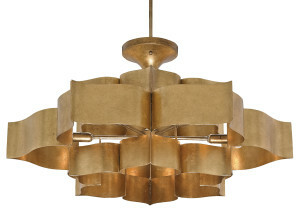 The Metro Rectangular Chandelier also has a pair of matching wall sconces. We are so grateful to those of you who help make our success possible — looking forward to seeing you again in Dallas and Atlanta this summer! This entry was posted in Currey & Company, Market, Products and tagged Chandeliers, glass, Gold, Lighting, mirrors, Modern, nautical, Oyster Shell, seashell, Table Lamp on April 22, 2014 by Currey & Company.